Using oilseed radish as a cover crop after winter wheat has been steadily increasing in popularity. Trademarked and sold as “Tillage” or “Groundhog” radish, this cover crop has been particularly popular in no-till production due to its large tap root that seemingly helps to alleviate soil compaction and aerate the soil. It also winter kills, decreasing the need for additional herbicides in the crop rotation (figure 1). However, there is a word of caution for choosing radish as a cover crop on highly erodible soils. This past spring we examined a no-till corn field in southeast Wisconsin which suffered significant erosion shortly after corn emergence. 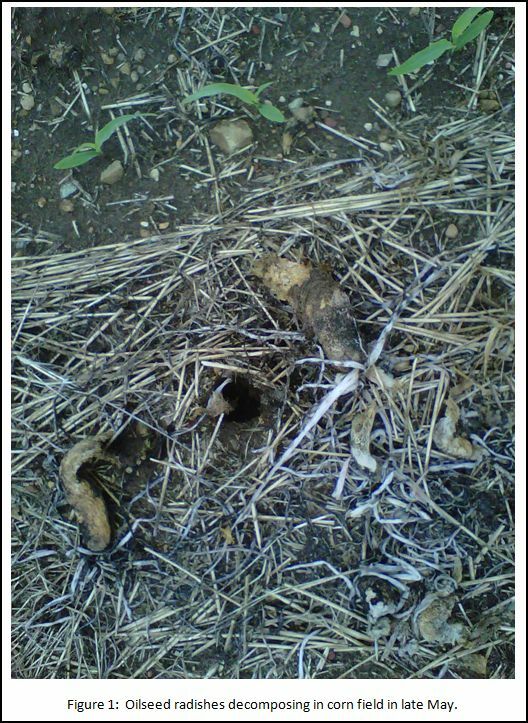 Radishes had been planted into wheat stubble in 30-inch rows in 2010 for the purpose of “biotillage” (figure 2). 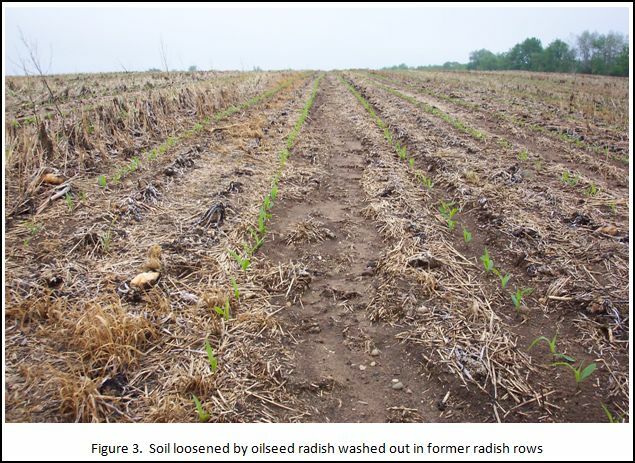 Field observations suggest that the radishes did a good job of loosening the soil in rows, which left it vulnerable to water erosion. Rills formed down the decomposing radish rows (figure 3). Lack of surface cover and a sloping field allowed water to gain momentum and create larger wash-outs. 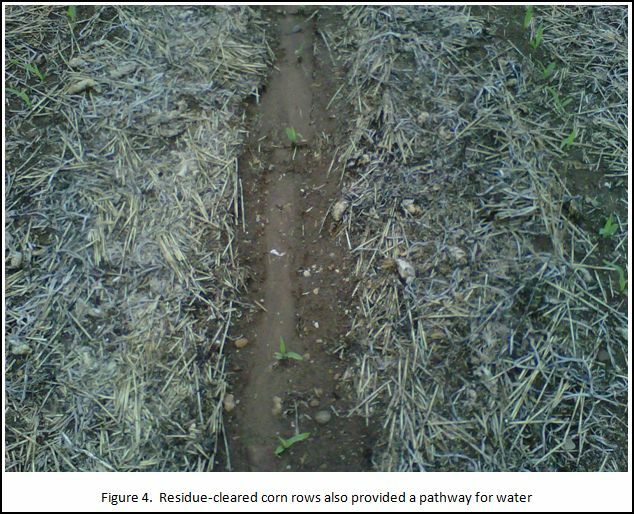 Residue-cleared corn rows also provided a pathway for the water and increased soil loss (figure 4). This observation is not meant to suggest that tillage radish should not be used as a cover crop but provides a cautionary note to growers. Using the radish as a sole cover crop on sloping or erodible fields may create this undesirable side-effect, especially if planted in wide rows with close spacings between plants. Oilseed radish planted as a part of mix of species such as oat may help to resolve some of these challenges by providing additional soil cover into the spring. This also provides a reminder that certain cover crops may work better in certain fields over others. Cover crop selection should obviously be based on its fit within the cash crop rotation but specifics of individual fields should also be brought into the selection process. 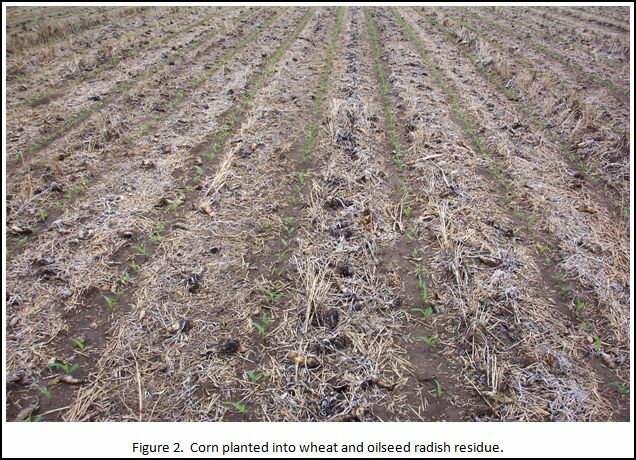 There has been limited research done on oilseed radish in Wisconsin, although several projects are being initiated this summer. Farmer observation, such as this, will help to build a working knowledge of radish and make the most of its benefits in standard crop rotations.